Update to Reports function: The option to select a method of Kn (turnover rate) calculation at the time of report generation is now available. Before this implementation, this option was only available in the tank specific reports. Now, this option is available for every report that uses tanks (TRI, A116, A121, etc). Improvement made to Net DMR report: The automatic upload of the Discharge Monthly report in the EPA system has been enabled. Improvement to UI - Two new columns have been created in the training event setup and training events. These column allow the user to input the amount of time that is expected for a training to be completed, and the amount of time it took. Improvement to Report M007 - In Section 3 of the SDS, the option to display the complete classifications or the classification based on the blend evaluation has been added, next to the chemicals of that product along with its EC Inventory number. Improvement to UI: The option to display the complete classifications or the classification based on the blend evaluation as well as displaying the EC Inventory number has been added. Improvement to UI: The system is now able to automatically evaluate transportation (Section 14) as "not regulated" where required. XML Upload: New for RY2016, the US EPA now supports and XML upload for Tier II Submit and Eplan. ERA has completed development for the upload and is currently finalizing testing. For RY2016, the EPA supports both the XML and the old MER import formats. Details by Product: ERA is currently finalizing development on a "Details by Product" feature. For each chemical included in Tier II processing, users will be able to view all details (usage or inventory) for materials that contribute to the maximum on-site calculation for Tier II. Save Source Selection: Now available, when processing a Tier II Project based on usage, all sources selected for the project will be saved and stored. This is especially useful if a user need to reprocess for any reason. Export to Excel in Tier II Product details: A new export option is now available in Tier II Product Details. New, Streamlined User Interface: ERA is currently finalizing development for a new and streamlined "wizard" for processing your Tier II. All selections are still available, but the wizard helps to simplify your selections is easier to follow and understand the options available. Details by Product: Similar to the TRI report, the Detail By Product feature is now available for all chemicals in the the TIER II report. This function will allow users to troubleshoot and review the data easily, by enabling the user to see the full history of which products and processes have been contributing to each reportable chemical. Sorting Last Created Tier II Projects: The system now has the capability to sort previously created Tier II projects in order from newest to oldest project. This feature allows the user to search and select the previous year's submitted report more easily, in order to carry over the previous required data such as health and safety hazard of the chemicals. Improvement to Universal Imports UI: Functionality added to batch assign ignore option in the Universal imports errors list, resolving the need to carry this out individually. 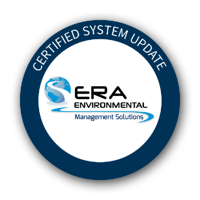 ERA Environmental's regulatory research team ensures that your ERA-EMS is always up to date with with regulatory and software changes. Every month we'll publish any updates here. It's part of our commitment to excellent customer service, environmental reporting expertise, and protecting your business. Have any questions about these updates? Let us know at info@era-ehs.com. The Office of Environmental Health Hazard Assessment (OEHHA) has added the below listed chemicals to the list of chemicals known to the state to cause reproductive toxicity (developmental, female, and male endpoints) for the purposes of the Safe Drinking Water and Toxic Enforcement Act of 1986.